We worry putting our family first means we'll be forced to abandon our careers. We're afraid if we pause our careers, we'll be forever off-track. 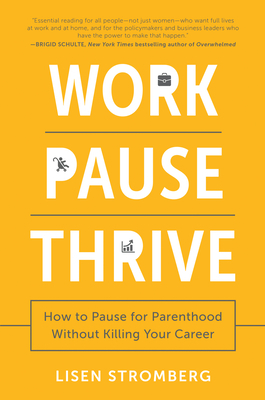 This thinking is outdated--forget what you've heard about how pauses are career limiting, about how those who pause lack ambition, or that if you do pause you won't be able to re-enter the paid workforce. That's a flawed reality, one that doesn't reflect the truth of the careers of some of the most successful women in this country. Author Lisen Stromberg knows this success firsthand. After the birth of her second child, she did something she never imagined she would do: she opted out to focus on her family. But her career didn't end there. Lisen paused then pivoted to become first a social entrepreneur and then an award-winning journalist writing about women, work, and life in Silicon Valley. Along the way, she learned she wasn't alone. Lisen met many highly successful women who told her they never "opted out" but who had, in fact, temporarily downshifted or paused their careers. Their hidden journeys revealed alternative nonlinear paths to the top that enabled them to achieve their personal and professional goals. After a successful career in marketing and advertising, Lisen Stromberg left the business world frustrated by the lack of support for mothers in the workplace. She pivoted to become an award-winning journalist whose work can be found in The New York Times, Fortune, Newsweek, Salon, and other high profile media outlets. Now Lisen is back to her business roots as CEO and Founder of PrismWork, a culture innovation consultancy. She and her team partner with companies, leaders, and advocates to innovate the workplace so the next generation isn't forced to choose between work and family. A sought after speaker and moderator, Lisen has inspired thousands with her talks on work+life integration, corporate talent innovation, disrupting the traditional career paradigm, and empowering women in the workplace. She has been seen on stage at SXSW, TEDx, The 3% Conference, and more. Lisen and her family live in San Francisco.